Spinal Hygiene: Yes, it’s a thing—and yes, it matters! preface by Snyder Building Construction: Let’s face it–construction is tough on our bodies. Keeping our employees and subs safe and healthy is a priority! So we invited Dr. Norris Golberg as a guest collaborator to share some tips for keeping our spines in tip-top shape. No matter if you’re a you’re in the office or out in the field, these simple exercises can go a long way to caring for your spine and preventing issues later on. Enjoy! When I think back on 2018, I’ve realized what a year it has been. Moving my family and life across the country, the birth of my beautiful baby girl, and working to open our state-of-the-art chiropractic office were big stressors. I also realized from a chiropractic perspective, we were putting a lot of stress on our bodies—particularly the spine. Think about it: we were packing and hauling boxes, sitting in cars and planes for long periods of time, carrying our newborn (and all of her belongings!) from place to place. And to top it all off, the hours of manual labor to get the office open. Just think of all the standing, walking, sitting, climbing and balancing, bending, crouching, crawling, lifting we’ve been doing! And despite my best efforts, I had forgotten to take care of my own spine. Whether or not you sit or swing hammers all day, you should be doing basic exercises or movements to keep your spine healthy. This is called Spinal Hygiene. And just like the concept of dental hygiene, where you brush and floss twice a day, you should do these movements at least twice a day. Your spine will thank you. Contrary to popular belief spinal pain is NOT normal; it is just pandemic because as a society we do not take very good care of it in the workplace. If you are experiencing spinal pain, or neurological symptoms such as radiating pain, numbness and tingling into the limbs, headaches, migraines, or other health concerns you may have misalignments in the spine. This can occur from trauma like accidents, sports injuries, but also from what is known as “micro-trauma”—the cumulative effects of repetitive stresses like bending, twisting, or sitting all day. Just like you get your teeth cleaned and checked for cavities twice a year, you should be getting your spine check for misalignments, and corrected if found. The difference with manual labor is you are actively working so your core muscles help brace your spine. While the overall loads with manual labor can be higher, the body is resisting and countering the stresses. When you are sitting, it is hard to keep your core active, which allows the spine to deform, putting more strain on the discs, bones, ligaments and tendons. This adds up big time. Along with decreased blood flow, this can be detrimental to your health. In fact, sitting for long periods (like watching lots of television or sitting at a desk all day) has been correlated with shorter life expectancy, REGARDLESS of exercise! (2) What’s the solution?…stop sitting! Get a standing desk, or if you have to sit, get up and move every 30 minutes. Even just a few minutes of activity like walking to the bathroom or going to get a glass of water can really help counter spinal stresses. Getting started with spinal hygiene is simple. Click the link below to get free access to my YouTube channel and the Spinal Hygiene videos I post. Use these movements and incorporate them into your routine twice a day. Taking charge of your spinal health will help counteract the micro-traumas and health deterioration that occurs over time. Disclaimer: If you are experiencing pain, dizziness, or blurred vision you should stop immediately and consult with a professional. In my practice, we are constantly having these conversations with our practice members. While my specialty is neurologically based care, I know corrective exercises and movements are essential to a healthy spine and nervous system. At Koru Chiropractic we use technology to do a three-part neurological evaluation to assess how your nervous system is functioning. 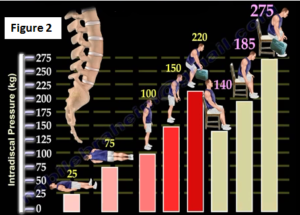 We analyze if you have spinal misalignments, how severe they are, and what effect they are having on your conditions and overall health and wellbeing. Our practice members love learning about the effect stress has had on their bodies over the years, and seeing how gentle and specific adjustments are making them feel and function better. Members find it very gratifying to see their improvement in numbers, graphics, and structural x-rays during their re-evaluations. It certainly eases the guilt of knowing sometimes we can’t avoid those harmful activities and stresses on our spine, but together we are being proactive. Koru Chiropractic (www.koruchiropractic.com) serves the Louisville and surrounding communities using neurologically based corrective care. Taking a specific and gentle approach to working with the spine, often times focusing exclusively on the upper cervical area, which can help with much more than just neck pain or low back pain. Results and improvements in health are achieved by correcting spinal misalignments, also known as vertebral subluxations, thereby restoring the optimal function of the nervous system. Koru: A Māori (Indigenous New Zealander) word for an unfurling fern symbolizing new life, growth, strength and peace.